As we spend time most summer Saturdays at the Downtown Farmer’s Market, we make friends with the shoppers and with the children and dogs they bring with them. This summer we met Nina, age 8, who visits our table each Saturday morning. Her eyes sparkle, she has a smile for everyone, and a warm energy propels her. Nina is constantly moving—until she finds a dog she can pet. Then she becomes calm and gentle as she strokes the dog, talking quietly. Every dog that passes gets her attention, and Nina lets each one know she wants nothing more than a chance to cuddle and whisper sweet words in their ears. She pays special attention to Ginger & Peaches, two Dachshunds who snuggle in a soft bed on the sidewalk behind our table. Nina’s joy is infectious. Meeting Nina and her family is one of the great rewards of our Saturday mornings at the Farmer’s Market. They symbolize our experience of the market, with its constantly passing panorama of children and shoppers and dogs. 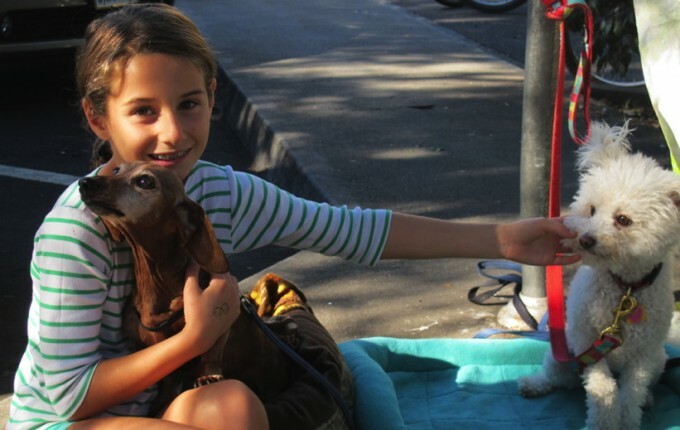 Nina and her two older brothers also represent young people who love animals. 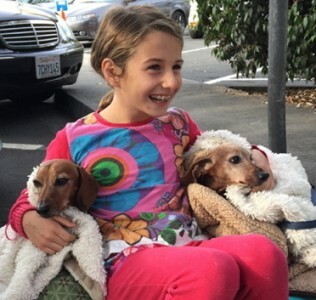 This generous family regularly babysits their neighbors’ dogs, allowing the children to practice responsible animal care. Their parents are impressed and have promised that in a few months they’ll have a dog of their own!